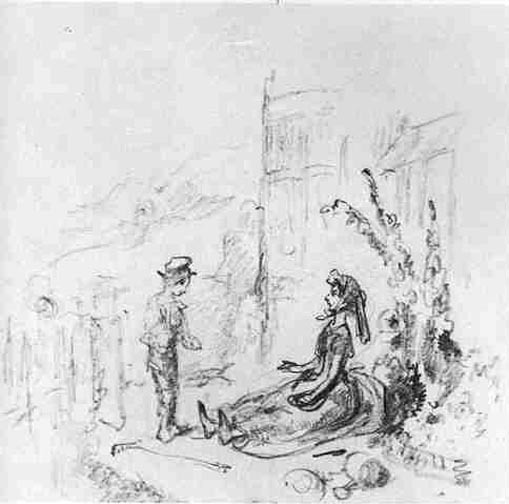 "I make myself known to my Aunt" for "David Copperfield" by "Phiz"
Dickens's David Copperfield, ch. 12, "The Sequel of My Resolution." 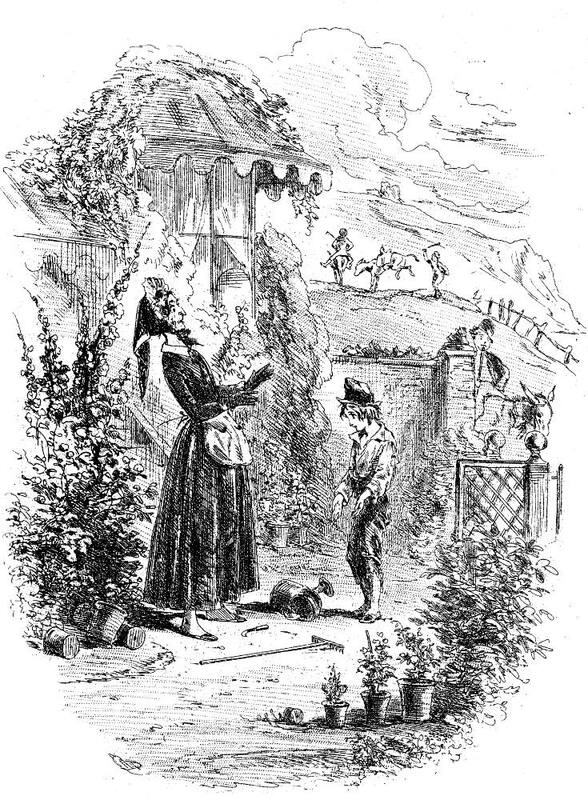 Source: Centenary Edition, facing page 228.
there came out of the house a lady with her handkerchief tied over her cap, and a pair of gardening gloves on her hands, wearing a gardening pocket like a toll-man's apron, and carrying a great knife. I knew her immediately to be Miss Betsey, fr she came stalking out of the house exactly as my poor mother had so often described her stalking up our garden at Blunderstone Rookery. "Go away!" said Miss Betsey, shaking her head, and making a distant chop in the air with her knife. "Go along! No boys here." "If you please, ma'am," I began. "Eh?" exclaimed Miss Betsey, in a tone of amazement I have never heard approached. Since she is still standing, rather than bowled over with amazement, this is the point captured, even if the donkey-boy and mount shown approaching Miss Betsey's garden gate do not in fact arrive for some four pages. Cohen, Jane Rabb. 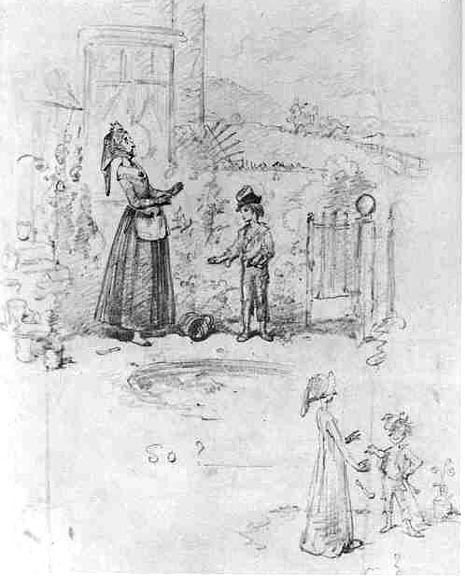 Charles Dickens and His Original Illustrators. Columbus, Ohio: Ohio U. P., 1980. Dickens, Charles. David Copperfield, il. Hablot Knight Browne ("Phiz"). The Centenary Edition. London and New York: Chapman & Hall, Charles Scribner's Sons, 1911. Hammerton, J. A. The Dickens Picture-Book. London: Educational Book Co., 1910. Steig, Michael. Dickens and Phiz. Bloomington, Indiana: Indiana U. P., 1978.